December might just be the month you can expect to get more correspondence in your real life mailbox (besides maybe your bday). After the flood of election mail last month I'm looking forward to some more welcome'd red and green envelopes in the mail. But mail shouldn't be just for birthdays and the holidays. Did you know every month I send out envelopes of goodies? I send out a Tiny Letter email and the first 3 people who write me back win the mail game! They get a unique bundle of goods in their real mail boxes. There's always something handmade in the mailings whether it's some zentangle'd tags, 3D glasses, or calligraphy addressed on the front. And every month has included a sample of the mail art envelopes I make. Zentangle'd tags from a past mailing. Envelopes from a past mailing. New mail art envelopes in Christmas colors will be in December's mailing. They're also available for purchase in my shop! Contents of a past mailing. Includes items to help you send your own mail or wrap a gift. The Tiny Letter emails are also a monthly wrap up of projects from the blog and sometimes discount codes (hint, hint) and some timely tidbits that don't make it to the blog. Because it's December you can be assured that it will be a fun package arriving in the mail instead of just a standard envelope. The mailing will be going out soon and I'd love to have you playing the mail game! Please sign up! Posted in Mail and tagged with zentangle, mail art. December 3, 2014 by Shasta Garcia. The US flag is a malleable thing. In it's nearly 240 years it's had 27 official versions though there was no designated arrangement for the field of stars until the 1912 introduction of the 48 starred flag (source). Did you know that?! The fact the flag has changed forms many times makes it seem less sacred. More sacred are the rights written within the constitution that imbued us with the ability to use the flag as a symbol to herald or question our country. Whichever you prefer. You can paint it on your jean shorts or create fine art. So there you go! I'm doing my patriotic duty by playing with the form of the American flag. If you break the flag down to it's simplest form it is two fields awaiting manipulation. Perfect for Zentangle and watercolors. Air mail inspired envelopes were perfect for mailing these notes. This project got me thinking of some American friends who now live internationally. I know they get home sick sometimes so I figured a little patriotic note in the mail around the 4th would be a welcome surprise. (Though if they're reading this it's maybe not such a surprise. I'm bad with figuring out the lead time for international mail). 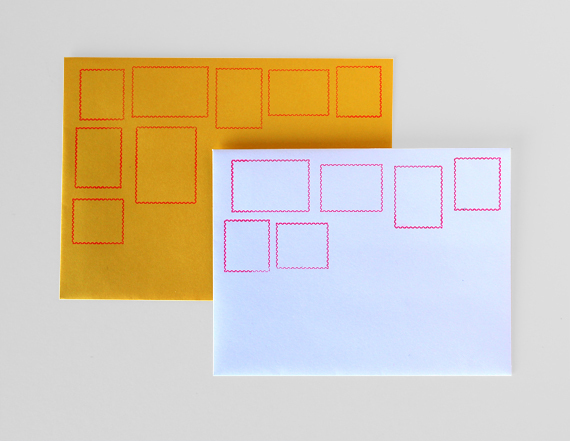 It's easy to DIY air mail envelopes. 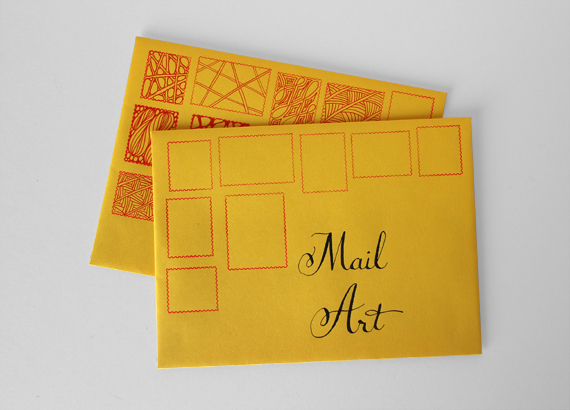 Use artists tape or another low tack tape to mask off the edges of your envelope. Paint red diagonal stripes leaving room for blue stripes. Follow up with blue leaving some hints of white. The thickness of your paint brush will be the thickness of your lines. 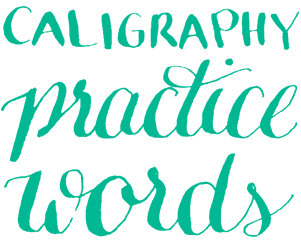 This would be a special addition to any note in the mail and could be created in other color palettes. I'm a fan of red white and blue year round but in July I like to use the palette for patriotic fun. Last year I wrapped gifts and the year before I also made note cards but with washi tape. For more inspiration on the American flags form I've got a Pinterest board exploring its red white and blue textures. Happy 4th of July everyone! Posted in Zentangle, Mail and tagged with red white and blue, flag, 4th of July, zentangle, DIY. July 1, 2014 by Shasta Garcia. 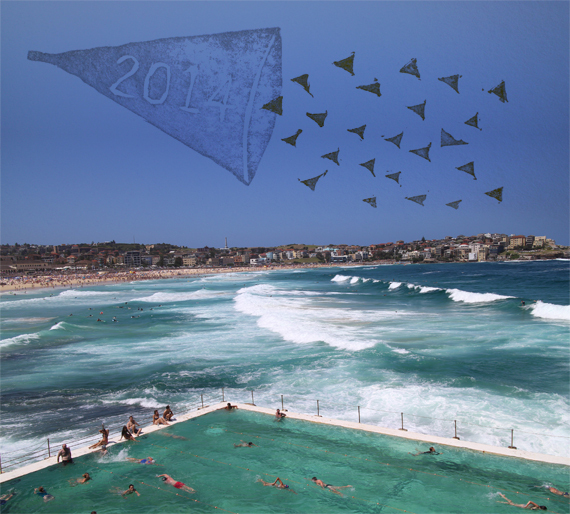 View of Bondi Beach from Icebergs Swim Club. My first two weeks of 2014 were spent on the other side of the world playing in Australia. I was in Sydney, Bondi (pronounced Bond-EYE which was my home base), the Blue Mountains, Melbourne, and then some more Sydney and Bondi. My memories are glowing. For the record it smells great there. Food is fresh and tastes of summer. Bird sounds are slightly different than California. Louder. Bigger insects. And I think I came back a fan of humidity. I'll have more pictures to share next week. I'm sifting through them and still pouring sand out of my luggage. For a glimpse into my trip I posted throughout on Instagram using the hash tag #shastablastaupsidedown. While I was on vacation my creative brain got a much needed break. It's slowly coming back to me. It had been taxed from holiday crafts. In Australia my senses were overwhelmed by everything I was seeing and doing that there wasn't a lot of room for making. Inevitably some of my crafting spirit came out and I'm sharing those few items here this week. I packed with me a box of stamps and ink pads. For my birthday this past year I was gifted a stamp carving kit from Yellow Owl Workshop. This seemed like a great time to use it and was my first experience printing from something I'd carved. My grand plan was to buy postcards on my trip and stamp out Happy New Year sentiments on the picture side of the postcard. Well I learned a lot with this project as it didn't go as planned. I hadn't fully tested things before leaving and it hadn't occurred to me how the stamps would react on high gloss paper. The 2014 stamp was unreadable so I abandoned it for a back-up stamp I'd brought. But I also hadn't accounted for humidity. Over a week later and the ink never dried. Ultimately I stamped on the less glossy writing side of the card. I'd love to do this project again when I travel now that I've learned a few lessons. It's an easy way to be able to send a lot of cards as it can be hard to find writing time when having new adventures. Next time I'd have a stamp made instead of carving my own only because the pro-grade stamps can handle more variables. Carving stamps was fun and I'd totally do that again just not for this exact project. 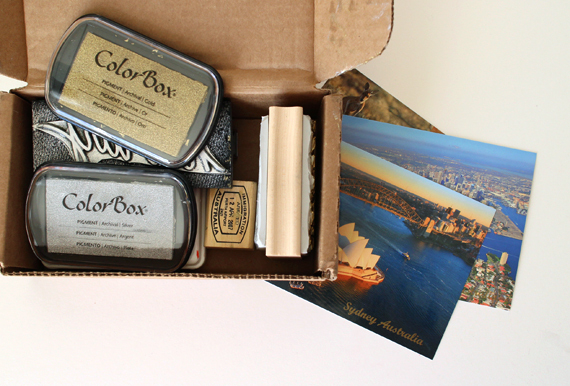 A week before leaving I found an Australian immigration stamp at my favorite art store and had to buy it. I carved out the middle which had Perth as the destination and a random date. Of course a trip to the beach isn't complete without collecting some craft supplies. 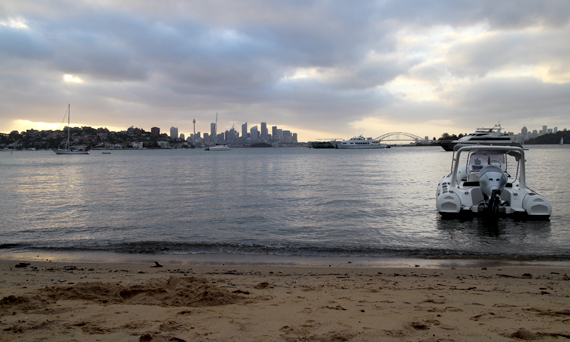 I actually didn't see to many shells until we had a picnic on Queens Beach along the Sydney Harbor. Queens Beach. Not our boat. The Yoga Hike Master also traveling with me in Australia and I created this shell Om during our picnic. On my last full day I sat on the Grassy Knoll at Bondi Beach and Zentangled this cardboard boom box. I gifted it to my wonderful host and tour guide. I took breaks to jump in the ocean as it was one of the warmest days of my visit. Posted in Miscellaneous made, Show and tell, Mail and tagged with mail art, rubber stamps, postcards, travel, zentangle, Sea Shells. January 22, 2014 by Shasta Garcia.